The Kyrie/Lebron questions just won't go away. But Kyrie Irving's responses to them need to be controlled. Coach Brad Stevens is looking for leadership somewhere within the team structure. This wasn't what Brad was seeking. 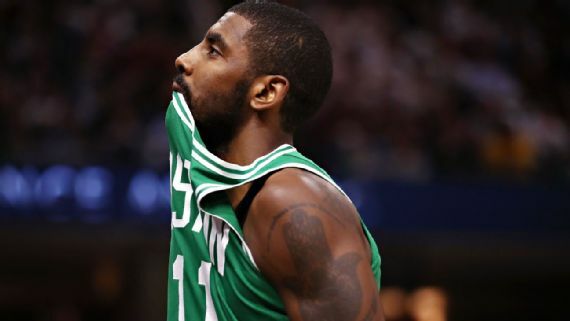 Boston Celtics guard Kyrie Irving took responsibility for a profane outburst directed at a fan in Philadelphia that yelled at him and referenced LeBron James during Friday's game against the 76ers. In a video that circulated on social media after Friday's game, a fan is heard shouting, "Kyrie, where's LeBron?" as Celtics players walked down their tunnel to the visitor's locker room at halftime. Irving appears to look up towards the fan before offering a profane response. Irving said he talked to the league office about his outburst on Saturday but was waiting to hear if he'd be fined. Asked if he had any regrets about the incident, Irving was emphatic he did not. "At the end of the day, we're human. It's in heat of the moment and frustrations arise, we were at halftime, we were down by 4, in an environment, a season-opener in Philly. Being with a young team like we have here and staying composed, handling that before we go in the locker room and addressing what we have to do in the locker room and going out and handling business and getting the W, that's really the only thing that matters to me. Asked what he would say to Irving, (Brad) Stevens responded, "You guys know what the right thing to do is. People make mistakes, hopefully they learn from them. There's a right and wrong, and if you're in the wrong, you have to own up to it." There will almost certainly be a fine from the League. I was glad to write about Irving's comments about the shape of the earth. I knew it was all in fun and that he was simply toying with us. I am not fond of writing this article. Boston is going through tough times attempting to integrate the new players into the system while dealing with numerous injuries. Can you picture Brad Stevens or Al Horford reacting the same way to another team's fans. I can't. Kyrie is the best player on the team. The team needs him to be a leader on the court and exert control away from it. We won the game, sloppy as it was. We didn't need this. The question regarding the next Celtics Captain is still up in the air, and I doubt this helps Kyrie's chances. Irving needs to prepare himself for the Lebron questions and taunts. After hearing "Where's Lebron?". how about "I don't see him. Is he in the stands?" or "He couldn't make it tonight. "- all while smiling and walking to the locker room. A much better response by an intelligent, talented Celtic. Maybe next time.